Jeff Kanbar followed his passion and launched a line of premium energy vodka. Not many people find their niche early in their careers. This wasn't the case for Jeff Kanbar, who was drawn to the liquor business in his early twenties. Lucky for him, his uncle, Maurice Kanbar, started SKYY Vodka in his San Francisco apartment in the late the '90s. "The company was tiny, maybe 10 employees or so, and he hired me to handle the New York market," Kanbar says, referring to his uncle's startup business. "I worked out of my studio apartment and would sell all day and then promote in the bars and clubs at night. It was an incredibly fun gig for a 23-year-old, to say the least." After working at SKYY for four years, Kanbar took a brief hiatus from the liquor industry before deciding to launch his own brand of vodka. The problem for Kanbar was that vodka was increasingly becoming a "me too" business--with everyone coming out with a new brand. He knew he had to differentiate his product from the rest of the pack. "The Red Bull and vodka craze was happening in full force at all the bars and clubs," Kanbar says. "I thought it might be just a fad, but as we all know, it became a worldwide phenomenon and still is. My friends and I were big Red Bull and vodka drinkers, but I didn't particularly care for the taste and all the sugar and carbs that came along with it." 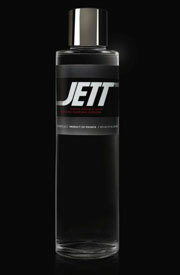 The result was JETT , a premium energy vodka--vodka infused with caffeine, guarana and ginseng--produced in France. Since caffeine, guarana and ginseng all have a bitter taste and/or dark coloring, JETT went through rigorous testing during development to ensure that even with the addition of these ingredients, the quality and flavor of the vodka remained uncompromised. Kanbar faced other problems: Most consumers didn't know his product existed, and he didn't have the means to compete with bigger companies. "I'm a very small shop with a very small marketing budget, and I'm taking more of a grass-roots approach to building the brand," Kanbar says. "I love the freedom and control I have doing it this way, but it makes things incredibly challenging when your competitors have millions of dollars to throw around. You have to have incredible patience and belief in your brand." Kanbar credits JETT's success to its unique position in the vodka category. "It really hits all ages," Kanbar says. "From the twentysomething club-goers who want an alternative to Red Bull and vodka to the 50-year-old executive who wants an enhanced but sophisticated cocktail after work." As for the future, Kanbar doesn't have an exit strategy. JETT is currently sold exclusively in the Los Angeles area and is doing well. His strategy is similar to the one his uncle used at SKYY. Maurice Kanbar spent a few years building the SKYY brand and a loyal following in San Francisco before deciding it was time to expand. "A lot of startup brands spread themselves too thin by rapidly expanding when there's simply not enough demand established to support it," Jeff Kanbar says. Kanbar wants to build the brand and introduce it to more markets. "Vegas, New York, Miami and San Francisco are definitely at the top of my list," Kanbar says. "If I can make a good living and continue having this much fun, I hope it never ends."